HIGH POINT, N.C., Oct. 10, 2016 – The High Point University Poll’s most recent survey of North Carolina’s likely voters finds remarkable stability with Hillary Clinton receiving support from 43 percent of likely voters and Donald Trump receiving support from 42 percent of likely voters. The percentages from this survey were calculated to include respondents who said they didn’t know exactly who they’d vote for, but were leaning one way or the other. These results are nearly identical to the poll’s September findings. The other two top of the ballot races in North Carolina show Attorney General Roy Cooper with 49 percent support from likely voters, compared to incumbent Gov. Pat McCrory’s 42 percent when taking into account leaning voters. Cooper had support of 50 percent of the likely voters interviewed for the September poll, and 41 percent of likely voters supported McCrory. Incumbent U.S. Senator Richard Burr has 47 percent support from likely voters including leaners, compared to 42 percent for challenger Deborah Ross. 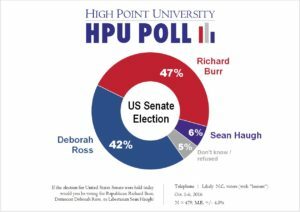 The September HPU Poll found Burr and Ross with 45 percent and 43 percent support, respectively. Libertarian candidates Gary Johnson, Sean Haugh and Lon Cecil receive support from 8, 6 and 3 percent of likely voters in their races for president, U.S. Senate and North Carolina Governor, respectively. The poll also finds that 49 percent of the likely voters in the survey approve of President Barack Obama’s job performance, while 46 percent disapprove. This can be compared to his job approval rating of 40 percent among likely voters during mid-October of 2014. The poll also finds that barely more than one-fifth (22 percent) of the same respondents believe the country is headed in the right direction, versus almost three-quarters (73 percent) who see the country as being on the wrong track. When North Carolina likely voters were asked if they’d vote for the Republican or Democratic candidate within their congressional district, 45 percent of likely voters said they’d support the Republican candidate, whereas 42 percent said they’d support the Democratic candidate. 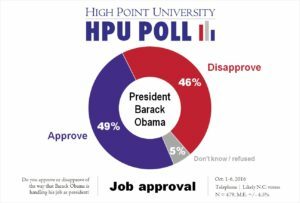 Although not a statistically significant change, the previous HPU Poll found the Republican candidate received 43 percent of likely voter support whereas the Democratic candidate received 46 percent. If the election for President of the United States were held today would you be voting for Republican Donald Trump, Democrat Hillary Clinton, or Libertarian Gary Johnson? [ASKED ONLY OF PEOPLE WHO SAID THEY DID NOT KNOW WHO THEY WOULD CHOOSE] Are you leaning toward voting for Republican Donald Trump, Democrat Hillary Clinton, or Libertarian Gary Johnson? If the election for United States Senate were held today would you be voting for Republican Richard Burr, Democrat Deborah Ross, or Libertarian Sean Haugh [PRONOUNCED “HAW”]? [ASKED ONLY OF PEOPLE WHO SAID THEY DID NOT KNOW WHO THEY WOULD CHOOSE] Are you leaning toward voting for Republican Richard Burr, Democrat Deborah Ross, or Libertarian Sean Haugh? If the election for Governor of North Carolina were held today would you be voting for Republican Pat McCrory, Democrat Roy Cooper, or Libertarian Lon Cecil? [ASKED ONLY OF PEOPLE WHO SAID THEY DID NOT KNOW WHO THEY WOULD CHOOSE] Are you leaning toward voting for Republican Pat McCrory, Democrat Roy Cooper, or Libertarian Lon Cecil? If the elections for U.S. Congress were being held today, would you vote for the Republican Party’s candidate or the Democratic Party’s candidate for Congress in your district? Or, will you vote for some other party’s candidate? 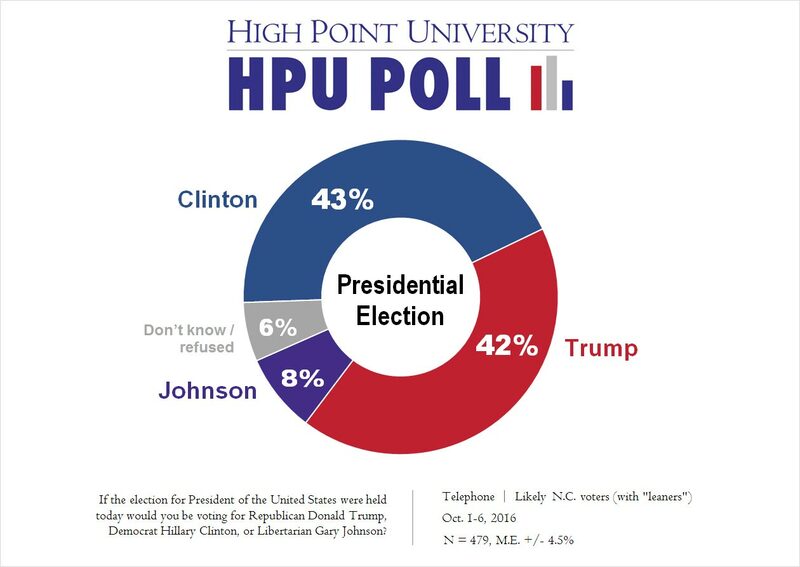 The High Point University Survey Research Center interviewed 479 state of North Carolina likely voters Oct. 1 through Oct. 6, 2016, using Registration Based Sample (aka Voter List Sample) purchased from Survey Sampling International through Aristotle in Washington, D.C. To be included in the sample, a voter needed to have a propensity score of more than 30 on a scale of 0 to 100 based on their voting history in presidential and midterm elections and demographics. In order to confirm voters’ likelihood of voting, they were asked an additional screening question: “On November 8, North Carolina will hold its election for President, U.S. Senate, Governor, U.S. House of Representatives, and other offices. How certain are you that you will vote in this election? Are you almost certain to vote, you probably will vote, your chances of voting are 50/50, or you will not vote in the November 2016 general election?” Only respondents who indicated they were “almost certain” to vote or “probably” would vote were considered to be likely voters. Only the 479 respondents interviewed were determined to be likely to vote in the Nov. 8, 2016 general election. This research was conducted 100 percent by telephone. Respondents on both cell phones (348 interviews) and landlines (131 interviews) were contacted by live operators at the Survey Research Center, who hand-dialed the telephone and completed the interview. Details from this survey are available at www.highpoint.edu/src/files/2016/10/48memoA.pdf. Further results and methodological details from the most recent survey and past studies can be found at the Survey Research Center website at www.highpoint.edu/src. The materials online include past press releases as well as memos summarizing the findings (including approval ratings) for each poll since 2010. 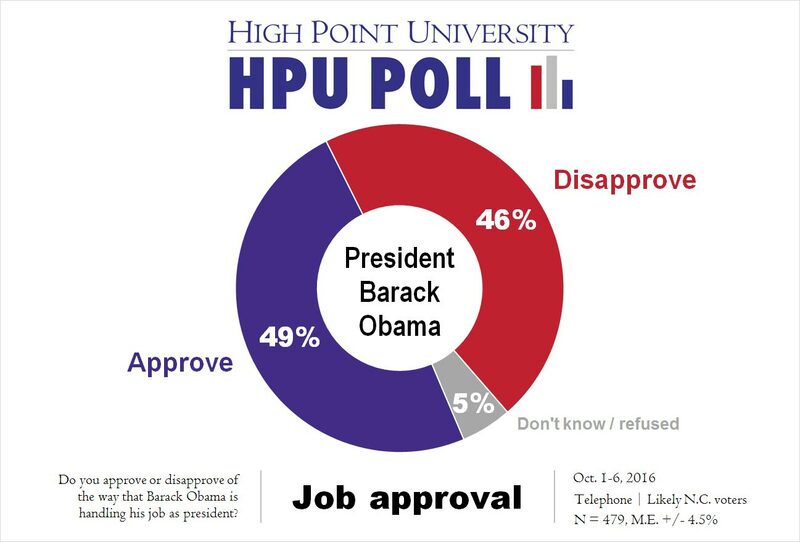 You can follow the HPU Poll on Twitter at twitter.com/HPUSurveyCenter.